The following section provides some guidelines on planning various aspects of your Red Hat OpenStack Platform environment. 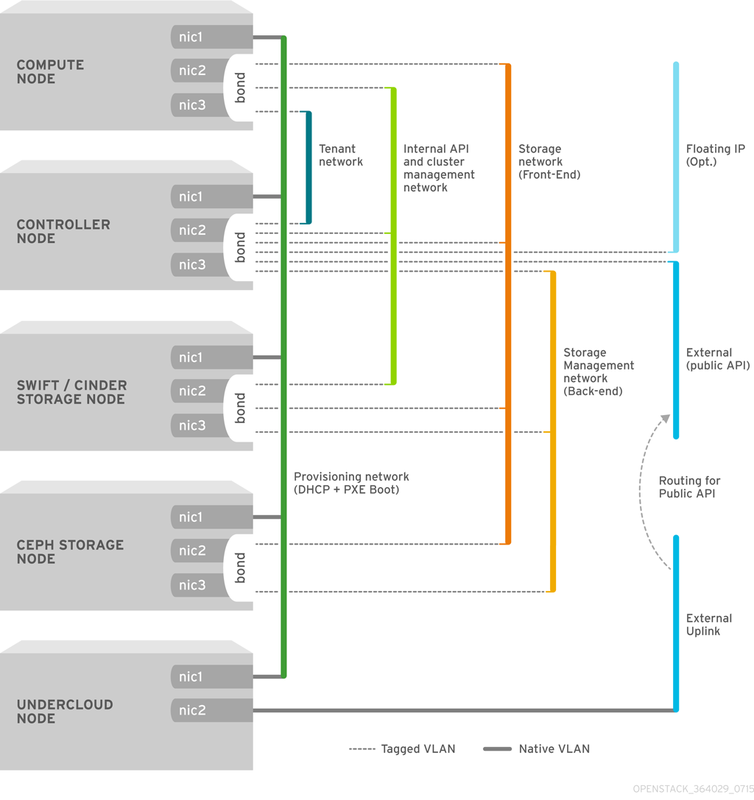 This includes defining node roles, planning your network topology, and storage. Provides key services for controlling your environment. This includes the dashboard (horizon), authentication (keystone), image storage (glance), networking (neutron), orchestration (heat), and high availability services. A Red Hat OpenStack Platform environment requires three Controller nodes for a highly available environment. Environments with one node can be used for testing purposes. Environments with two nodes or more than three nodes are not supported. A physical server that acts as a hypervisor, and provides the processing capabilities required for running virtual machines in the environment. A basic Red Hat OpenStack Platform environment requires at least one Compute node. A host that provides Red Hat Ceph Storage. Additional Ceph Storage hosts scale into a cluster. This deployment role is optional. A host that provides external object storage for OpenStack’s swift service. This deployment role is optional. The following table provides some example of different Overcloud configurations and defines the node types for each scenario. It is important to plan your environment’s networking topology and subnets so that you can properly map roles and services to correctly communicate with each other. Red Hat OpenStack Platform uses the neutron networking service, which operates autonomously and manages software-based networks, static and floating IP addresses, and DHCP. The director deploys this service on each Controller node in an Overcloud environment. Network used for power management of nodes. This network is predefined before the installation of the Undercloud. The director uses this network traffic type to deploy new nodes over PXE boot and orchestrate the installation of OpenStack Platform on the Overcloud bare metal servers. This network is predefined before the installation of the Undercloud. The Internal API network is used for communication between the OpenStack services using API communication, RPC messages, and database communication. Neutron provides each tenant with their own networks using either VLAN segregation (where each tenant network is a network VLAN), or tunneling (through VXLAN or GRE). Network traffic is isolated within each tenant network. Each tenant network has an IP subnet associated with it, and network namespaces means that multiple tenant networks can use the same address range without causing conflicts. Block Storage, NFS, iSCSI, and others. Ideally, this would be isolated to an entirely separate switch fabric for performance reasons. OpenStack Object Storage (swift) uses this network to synchronize data objects between participating replica nodes. The proxy service acts as the intermediary interface between user requests and the underlying storage layer. The proxy receives incoming requests and locates the necessary replica to retrieve the requested data. Services that use a Ceph backend connect over the Storage Management network, since they do not interact with Ceph directly but rather use the frontend service. Note that the RBD driver is an exception, as this traffic connects directly to Ceph. Hosts the OpenStack Dashboard (horizon) for graphical system management, the public APIs for OpenStack services, and performs SNAT for incoming traffic destined for instances. If the external network uses private IP addresses (as per RFC-1918), then further NAT must be performed for traffic originating from the internet. Allows incoming traffic to reach instances using 1-to-1 IP address mapping between the floating IP address, and the IP address actually assigned to the instance in the tenant network. If hosting the Floating IPs on a VLAN separate from External, you can trunk the Floating IP VLAN to the Controller nodes and add the VLAN through Neutron after Overcloud creation. This provides a means to create multiple Floating IP networks attached to multiple bridges. The VLANs are trunked but are not configured as interfaces. Instead, neutron creates an OVS port with the VLAN segmentation ID on the chosen bridge for each Floating IP network. In a typical Red Hat OpenStack Platform installation, the number of network types often exceeds the number of physical network links. In order to connect all the networks to the proper hosts, the Overcloud uses VLAN tagging to deliver more than one network per interface. Most of the networks are isolated subnets but some require a Layer 3 gateway to provide routing for Internet access or infrastructure network connectivity. It is recommended that you deploy a project network (tunneled with GRE or VXLAN) even if you intend to use a neutron VLAN mode (with tunneling disabled) at deployment time. This requires minor customization at deployment time and leaves the option available to use tunnel networks as utility networks or virtualization networks in the future. You still create Tenant networks using VLANs, but you can also create VXLAN tunnels for special-use networks without consuming tenant VLANs. It is possible to add VXLAN capability to a deployment with a Tenant VLAN, but it is not possible to add a Tenant VLAN to an existing Overcloud without causing disruption. Any unassigned networks are automatically assigned to the same subnet as the Provisioning network. The diagram below provides an example of a network topology where the networks are isolated on separate VLANs. Each Overcloud node uses two interfaces (nic2 and nic3) in a bond to deliver these networks over their respective VLANs. Meanwhile, each Overcloud node communicates with the Undercloud over the Provisioning network through a native VLAN using nic1. Images - Glance manages images for VMs. Images are immutable. OpenStack treats images as binary blobs and downloads them accordingly. You can use glance to store images in a Ceph Block Device. Volumes - Cinder volumes are block devices. OpenStack uses volumes to boot VMs, or to attach volumes to running VMs. OpenStack manages volumes using Cinder services. You can use Cinder to boot a VM using a copy-on-write clone of an image. Guest Disks - Guest disks are guest operating system disks. By default, when you boot a virtual machine with nova, its disk appears as a file on the filesystem of the hypervisor (usually under /var/lib/nova/instances/<uuid>/). It is possible to boot every virtual machine inside Ceph directly without using cinder, which is advantageous because it allows you to perform maintenance operations easily with the live-migration process. Additionally, if your hypervisor dies it is also convenient to trigger nova evacuate and run the virtual machine elsewhere almost seamlessly. If you want to boot virtual machines in Ceph (ephemeral backend or boot from volume), the glance image format must be RAW format. Ceph does not support other image formats such as QCOW2 or VMDK for hosting a virtual machine disk. See Red Hat Ceph Storage Architecture Guide for additional information. The director creates an external object storage node. This is useful in situations where you need to scale or replace controller nodes in your Overcloud environment but need to retain object storage outside of a high availability cluster.